Home latest social media Does Gambia's Election Redefine Social Media's Political Role? Does Gambia's Election Redefine Social Media's Political Role? On Friday afternoon, it was announced that Gambia's authoritarian President Yahya Jammeh had, against extraordinary odds, lost the 2016 general election by a huge margin of nine percentage points. 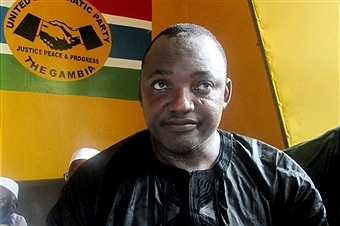 Opposition leader Adama Barrow rallied a coalition of eight political parties to secure his electoral victory. The shock result occurred despite Jammeh's government banning all international calls and internet communications, including those made via social media, on the eve of the election itself. So, what does this tell us about the importance of social media to the process of democratic politics? The administration of President Jammeh, who himself won power in 1994 in a bloodless coup and has ruled Gambia for over two decades, is widely described as totalitarian. Indeed, Jammeh previously declared that protests against the 2016 election results would not be tolerated. Last week's ban on social media and other communications was therefore an attempt to enforce this measure, and less to help the state sway voter opinions. Some also claim the measures were an attempt to facilitate state-led ballot fraud, as the blackout made it difficult for observers to track polling stations. Authorities said the embargo was implemented to prevent disorder in the country and to keep the peace during election time; most likely in anticipation of another electoral victory for Jammeh and subsequent voter discontent. Critics, however, have re-iterated their stance that such measures were implemented in order to preemptively quell democratic discourse and to obscure criticism of the state to overseas observers. Reports of voter intimidation by state actors during the election, for example, could have been far more numerous and detailed if channels of communication had been unimpeded. Whatever the motive, the crackdown itself seemed to have been effective in curtailing unrest, with the streets of Gambia's capital Banjul empty on Thursday night. In light of the shock election result, however, should we reconsider our perception of social media as being a potent, important political force in the modern world? After all, Barrow's victory occurred despite it being banned. In short, not really. Today, there is mounting evidence to suggest that social media websites are amongst the world's foremost mechanisms for generating political change and activism. That's been particularly true since the Arab Spring, which began in late-2010 and was famously fueled largely by social media activism. More recently, however, US President-elect Donald Trump has become notorious for his use of Twitter to drum-up support; and we have recently seen further evidence from state actors in Cameroon, Great Britain and India to suggest that authorities across the world are now acutely aware of the potential for such websites to cultivate grassroots activism in a manner which they deem threatening to the integrity of the state or society. All such cases have also raised fundamental questions regarding the extent to which free speech is tolerable in modern nations; especially as it becomes increasingly possible for anybody to gain a voice in their respective public spheres. The importance of social media to political discourse is therefore not confined to the activism it can generate, but also extends to the way in which efforts to regulate its use reflect upon the regulators themselves. In the particular case of Gambia, we can now observe an outgoing regime which has, for twenty-two years, been characterised above all else for its extreme curtailing of free expression; and its incoming replacement which, we all hope, will afford a far greater measure of such freedoms to its citizens in the future.